Here’s a sampling of what the Maple Leafs and Lightning had to say following a 2-1 Leafs loss on Monday night. I thought they were good. They’re fast. They’re hard on the puck. They’ve got skill. I thought we had the puck a lot. (Tampa Bay) played last night so keep it in perspective but I still thought we had lots of opportunity and I thought they made plays and they played fast, so I was impressed with them. Kapanen, obviously, has breakaway speed. Willy (Nylander) has skill. Hyman, a relentless worker who can still make plays, and Sosh (Soshnikov) I thought was good both ways so I thought those kids were good. I liked Carrick too. I thought he had some grease to him. It was pretty awesome, I’m not going to lie. I enjoyed playing tonight. I think the team played pretty well against Tampa Bay and I played pretty well myself so I’m happy. I’m a little tired right now but that’s part of the job. It was lots of fun. I think we created some chances. If I maybe could have scored one goal, but it was lots of fun so I think we gained a lot of experience from today and just keep building on from that. Very exciting. Terrific group of guys. Just got in today, just got to the rink here about 4 o’clock and got to know the guys and the staff. Fun group. Very exciting time, I think, for us. Tampa Bay’s a pretty good team but we hung with them so it was exciting to see the way we played. We’re only going to get better. We’ve played a lot of hockey of late. Three-in-four, back-to-back. Big thing for us was that we’ve got to get the lead and when you play these back-to-backs it’s so much easier to play with the lead. I thought we ended up scoring on some shots we shouldn’t have and missed some we probably should have scored but we got the lead and we did some good things, but ultimately we left it at the hands of our goaltender. Probably not the thing you want to do but Vassy (Vasilevskiy), he took it home for us. When Toronto really pushed there in the third, he was the guy for us tonight. We definitely didn’t have the juice that we’ve had after an emotional win yesterday, I think three-in-four. Give those guys credit, they had a lot of new faces in the lineup. They worked hard. They competed. We were able to get that 2-0 lead but it was a tough one. Sometimes you’ve got to win games like this one when you have tired legs and we found a way. 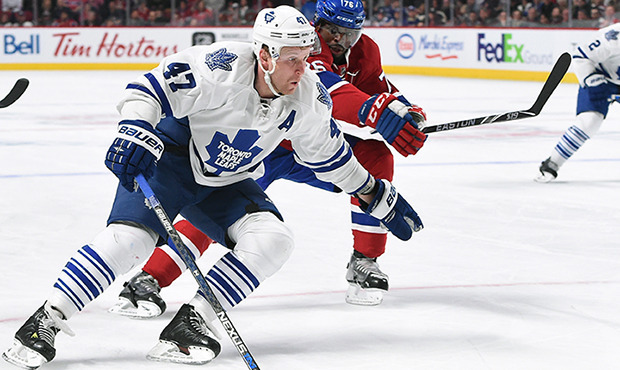 Here’s a sampling of what the Leafs had to say following Saturday’s loss in Montreal. The bottom line is that we were in a game that was 2-1 going into the third, we were set up to have success. Pacioretty made a real nice play pushing off Morgan Rielly for the one goal and I felt that was kind of the dagger that did us in right there. Our bench wasn’t very deep tonight. We know anyway, night-to-night, we’re going to have a challenge. I thought with all hands on deck we would have had a better opportunity. Early in the game, you want to keep things going forward. You don’t want to do too much east-west, so just trying to get pucks to the net early and lucky to get a rebound there and Hunwick put it in. It’s something that happened yesterday morning in the gym right before I went on the ice. It was kind of a soreness in my neck and it was kind of spasms. It came back during the game, like early, and it was just better for me to get off the ice. I think we played hard at times. We kept ourselves in the game. We had a couple of big kills but when they get two quick ones in the third it can be tough. Leipsic’s speed, shot leads to Leafs’ first goal. Rookie winger Brendan Leipsic scored his first NHL goal in his first NHL game exactly two weeks ago against Vancouver – and in his fourth career game in hockey’s top league Saturday, he recorded his first career assist. The 21-year-old corralled the puck just inside Toronto’s blueline and took off like a bullet, flying down the ice before firing a shot at Habs goalie Mike Condon; the rebound went directly to Buds defenseman Matt Hunwick, who scored his second goal of the season (and second as a Leaf) at the 5:29 mark of the first period to give Toronto a 1-0 advantage. Leipsic finished the night with three shots on net in a career-best 18:17 of ice time. He is still acclimating to the NHL game, but he’s showing the things that made him so consistently dangerous with the AHL Marlies this season: he can skate with any player in the league, he’s got great instincts with the puck, and he’s tenacious enough to endear himself to his team and its fans and earn the ire of everyone else. It’s unfair to attach huge expectations to him, but it’s fair to acknowledge he’s a player capable of making an impact for this organization. Second-period not an ideal one for Toronto defensively. Montreal’s Alex Galchenyuk tied the game less than two minutes after Hunwick’s goal, but the two teams finished the period with the same number of shots (eight) and deserved to be tied after 20 minutes. 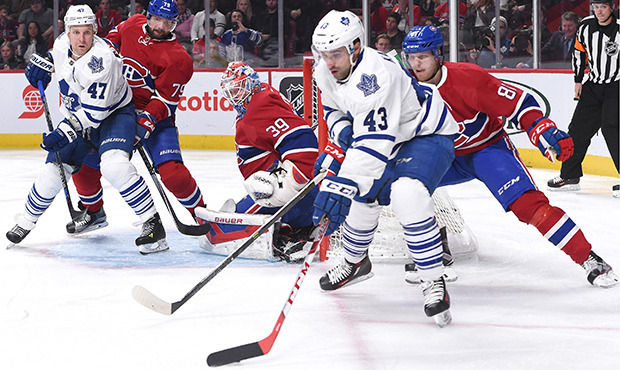 However, the Leafs failed to play a disciplined game in the middle frame – three of the four penalties they were assessed during the contest came in the second period – and the Canadiens fired a whopping 19 shots on Toronto goalie Jonathan Bernier in that second period. One of those shots – from winger Devante Smith-Pelly – beat Bernier for what would prove to be the game-winner. And although it’s true the Habs hardly were a defensive juggernaut in the second (the Leafs had 14 shots on net in that frame), Toronto can’t surrender scoring chances at a rate that would lead to nearly 60 shots on net in 60 minutes of play and expect to emerge with a victory. Montreal added insurance with a pair of goals from captain Max Pacioretty in the third, but the second period was the fault line from which the Leafs’ game cracked and fell apart. Hunwick’s return eases load on Leafs’ other blueliners. Hunwick returned to the lineup for the first time since Feb. 15, when he played 20 minutes against the defending Stanley Cup-champion Chicago Blackhawks. And while it was encouraging to see the 30-year-old contribute on offence, Hunwick’s bigger role in the wake of trades that made ex-Leafs out of Roman Polak and Dion Phaneuf is to be a veteran, stabilizing force for a very young defence corps. Indeed, one of the reasons head coach Mike Babcock was able to scale back Morgan Rielly’s ice time – from more than 25 minutes a night in each of the past three games, including logging 28:48 Thursday against Carolina – is because Hunwick is back. He wound up playing 23:31 Saturday, and will be relied on in even-strength and penalty-kill situations for the rest of the season. That isn’t likely to change next year, either. Injury bug bites Buds again. Toronto’s lineup has been ravaged by injuries in recent weeks, and two more Leafs were knocked out of action before the third period began. First, winger P-A Parenteau was forced into the dressing room for the night after playing just 2:36 in the opening frame with an upper-body injury; then, centre Byron Froese had to leave the game late in the second after blocking a shot by Habs D-man P.K. Subban. Toronto has a day off Sunday before taking on Tampa Bay Monday at Air Canada Centre, and it looks as if they’ll be needing a couple more bodies from the Marlies to fill out the roster. It’s good to head home – but the ACC won’t be an easy place to play for the home team. The Leafs headed home after the loss to the Habs, and while it will be nice for them to play before a supportive crowd at the ACC in three of their next four games, all three of those home tilts will come against teams that either are at or near the top of their division (the Bolts) or are desperately pushing to secure a playoff spot (the Minnesota Wild, who arrive in town next Thursday and the Ottawa Senators, who next Saturday will bring Phaneuf back to Toronto for the first time since he was traded). Oh, and Toronto’s sole road game in the next week is in Washington on Wednesday against the powerhouse Capitals. The Leafs won’t have anywhere close to all hands on deck for any of those games, so only a consistent effort and a smart approach is going to put them in a winning position. 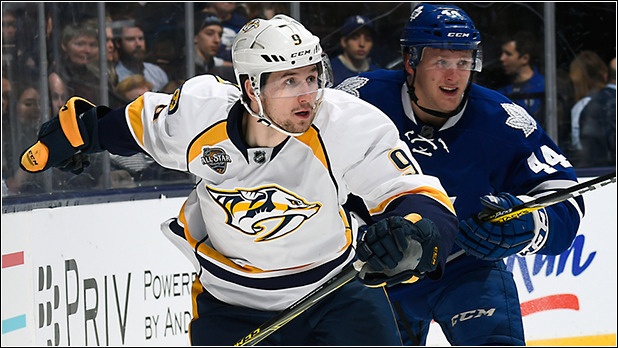 Here’s a sampling of what the Maple Leafs and Predators had to say following a 3-2 Toronto loss on Tuesday night. I like the way we started to be honest with you. I thought we had everything going perfect, not much was going on. They went to dump it in on the power play and fanned on it and then the next thing you know their guy is in home free on a breakaway. Obviously we had a miscue on the second one which is disappointing, then I thought they took over the game for a bit until we got ourselves kind of organized and back at it. It would have been nice, Winnik had the wide open net there, it would have been nice to see him bury one. You want your guys to play hard, you want them to be organized. We understand what we’ve done to our team. In saying that, I thought Leiper (Leipsic) was really good tonight. I thought Percy was good. So you get opportunities and we’re looking for players and some guys separate themselves from others and you go from there. As a team I thought we battled hard. I don’t think we created a whole lot early on but I think that we got our legs going. They got that one power play goal, I’m not sure whether it was a fluke or not, and then they get a rebound goal, that kind of stuff. We took our time to get going and to start creating chances but I think once we did they started coming in bunches. I thought we played a pretty strong game. They got goals in back-to-back shifts almost, which was kind of a momentum killer there for us. We didn’t play a bad game at all. I thought we showed some resiliency and played okay. I thought we did a really good job for the most part. I thought they capitalized on the mistakes that we made, and we gave them those opportunities, which obviously we can do a better job of limiting those but I thought our third period was very strong and we showed a great push. We’re doing a lot of good things right now. It’s never easy, a back-to-back situation where he other team is waiting for you. I thought our guys competed hard and played smart and did some good things. We continued to collect points here, we need to. Three of the top teams in the league are in our division. Minnesota seems to be coming on right now so we need to get winning. It was great. Obviously, it put our team in a good spot with 3-0. It was all that we needed for tonight. TORONTO — Shayne Gostisbehere scored in overtime, extending his scoring streak to 15 games, as the Philadelphia Flyers edged the Toronto Maple Leafs 5-4 on Saturday night. Sam Gagner and Jakub Voracek scored 39 seconds apart in the first period for the Flyers (26-21-11), joined by Brayden Schenn and Matt Read on the scoresheet. Nick Spaling snapped a 60-game drought while Byron Froese scored for the first time in two months for Toronto (20-27-10), his second goal of the season. Shawn Matthias, who was returning from a five-game absence due to whiplash, and Peter Holland also scored for Toronto. Toronto has lost 15 of its last 19 games. Making his second straight start, Jonathan Bernier gave up three goals on 13 shots in Toronto’s net and was replaced by James Reimer 57 seconds into the second period. Steve Mason started for the Flyers, but he too was replaced by Michal Neuvirth due to an apparent injury. Mason left the ice gingerly shortly after yielding the third Leafs goal to Peter Holland. 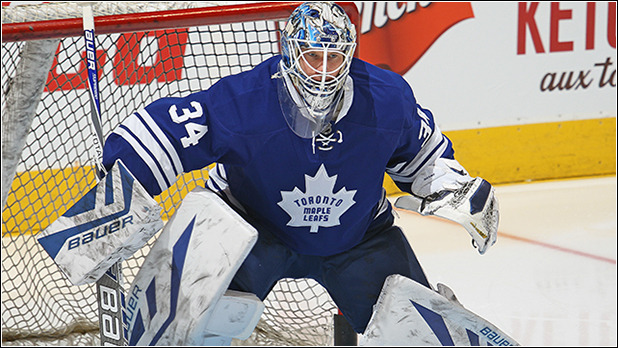 Neuvirth gave up one goal on 10 shots in relief, while Reimer stopped 12 of 15. 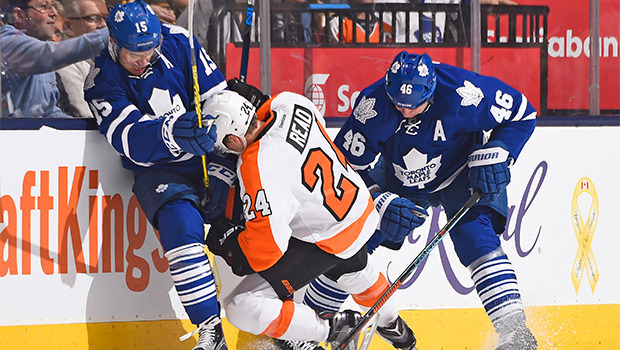 The Leafs had two one-goal leads erased, while the Flyers saw a two-goal deficit vanquished. A scratch in two of the previous three games, Gagner was in the Flyers lineup due to an upper-body injury to captain Claude Giroux, who is considered day-to-day. Komarov joined a lengthy list of missing Leafs which includes injured forwards James van Riemsdyk, Tyler Bozak, Josh Leivo, Milan Michalek and Joffrey Lupul as well as injured defencemen Matt Hunwick and Jared Cowen. Hunwick, the Leafs leader in average ice-time, missed his second straight game due to a lower-body injury. Saturday marked the 10th annual Canadian Armed Forces night at the Air Canada Centre. More than 500 members of the Canadian Armed Forces were in attendance. After the game the group was invited onto the ice for photo opportunities with members of the Leafs. The Flyers won for just the third time in their last nine games. After finishing a five-game road trip that took them through Western Canada last week, the Maple Leafs get to enjoy the comforts of Toronto and the full support of the Air Canada Centre crowd during a four-game homestand that begins Thursday against the New York Rangers. And although the road trip couldn’t be deemed a success and the Buds aren’t where they’d prefer to be in the standings, the mood in the dressing room remains upbeat as the players focus on building for the future. “I think we’re trending in the right direction,” said centre Nazem Kadri. “Some games we have a hard time staying consistent, but that’s standard for a young team, having those growing pains. It’s adversity, and you can’t just lie down and quit. And that’s something I feel like we’ve really been good at this year. But it seems like we’ll have a few good games, we’ll string them together, then we’ll kind of just lay an egg in the third or fourth game. Now, don’t take that to mean the Leafs are in any way satisfied with the way things have gone this year. Players live to put themselves in the most competitive situations, and when the playoffs aren’t a possibility, it can wear on them. 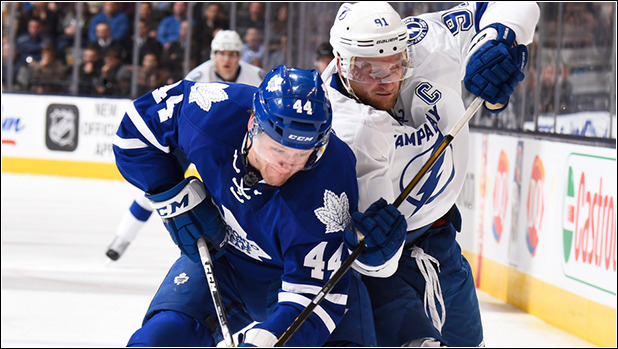 That’s certainly true of blueliner Morgan Rielly, who made it clear Toronto’s season – and, more recently, a blowout 7-2 loss to the Chicago Blackhawks Monday – didn’t sit well with him. After the Buds take on the Blueshirts Thursday, they face the Philadelphia Flyers Saturday, the Nashville Predators Tuesday and the Carolina Hurricanes next Thursday to close out the homestand. All four of those franchises have post-season aspirations, and the opportunity to play spoiler will be prominent in the Leafs’ minds. As Kadri noted, consistency – be it game-to-game, or even period-to-period – has been an issue for the Leafs this year. But in their first season under head coach Mike Babcock, Toronto’s players have recognized the growth they’ve experienced both as individuals and as a unit. It’s a relatively small consolation compared to a Stanley Cup championship, but it’s not something to be discounted, either. I think last year we kind of experienced something like this and I think you can kind of draw from those experiences and learn how to deal with it and how not to deal with it — try to make it easier on yourself. This is not something that you want to go through year after year so we’ve got to find a way to handle it while we’re experiencing it, but it’s not something we want to get used to. I’d agree with that, I think we’ve had some times where we’ve had pretty good stretches but when you take those nights off teams are going to make you pay whether it’s Ottawa, whether it’s Chicago. We’ve got to get that straightened out, we can’t be taking nights off against those teams. That’s just an issue we have to deal with as players and we have to be ready to play every night. What did you take from the Western Canada swing that you’d like to see consistently? I think we had times where we played well. That’s just the most important thing. We know we can play with teams in this League, we know we can win games against good teams. It’s just a matter of doing it every night. Travel can be hard but I think we battled and we have to continue to do that and be ready to play every night. There is an eerie symmetry to the Toronto Maple Leafs drop-offs experienced last season and again this year. They have come at roughly the same time. And they have been almost as severe. From early January to mid-February in 2015, the free-falling Leafs recorded just two wins in 19 games (2-15-2) to drop into the NHL’s basement. By June, they were picking fourth overall, high enough to draft London Knights star Mitch Marner. This year, after a 7-2 implosion in Chicago on Monday night, the Leafs are 4-11-2 in their past 17 games, and fading fast. If the draft lottery were held today, they would have the best chance of picking first overall (20 per cent) for the first time since taking Wendel Clark in the top spot in 1985. The biggest difference between this year and last is that an incredible run of injuries have played a starring role. Between trading captain Dion Phaneuf away to Ottawa last week and the loss of up to eight players at a time to injuries, the Leafs have had a skeletal roster of late. In Monday night’s game against the Chicago Blackhawks, Roman Polak had the most minutes among defencemen (24). Colin Greening, recently acquired from the Senators, had the most minutes among forwards (17), despite the fact he has spent most of the year in the American Hockey League with Binghamton. That arrangement didn’t work out so well against the defending Stanley Cup champs. That could be the postgame tale for a while. The Maple Leafs are about to face a run of good teams, with games against the New York Rangers, Nashville Predators, Tampa Bay Lightning and first-place Washington Capitals in the next two weeks. There is also the trade deadline looming on Feb. 29, when even more talent will be traded away. So yes, things can get worse. What’s made the Leafs’ situation unique is the organization has steadfastly refused to recall its best players from the minors. The Marlies are currently the top team in the AHL, with only nine regulation losses in 51 games, and young players such as William Nylander, Kasperi Kapanen, Rinat Valiev, Connor Brown, Nikita Soshnikov and Stuart Percy are better than some of those playing for the Leafs. Brendan Leipsic showed as much on Saturday against Vancouver, when he was granted his first NHL game and promptly scored his first NHL goal (the winner, no less). He hardly looked out of place. But he was promptly demoted before their next game. That’s because Leafs management sees little point in sacrificing development in order to prop up a makeshift NHL roster that was never going to contend this year. Most of the recalls all season have been older non-prospects – Rich Clune, Mark Arcobello and Byron Froese – to the detriment of the NHL roster, and the benefit of Toronto’s lottery chances. Is that tanking? In the strictest sense of the word, sure. But the Leafs were also only five points out of a playoff spot on Jan. 6 after 38 games, and before all the injuries. They’re still on pace for 73 points, five better than a year ago. If that’s tanking, it’s Tanking Lite compared with what teams such as the Buffalo Sabres and Coyotes pulled off last season in failed attempts to get McDavid. In fact, 73 points would be the best finish ever for a last-place NHL team. So if that was Leafs management’s sole intention with the season, they went about it in a curious way. The way that their year has gone is, in many ways, the best possible outcome. There have been obvious improvements thanks to Babcock. The work ethic is there. And the Marlies have played like world-beaters. Finishing 30th, thanks to injuries, trades and an insistence on protecting the kids, won’t be a black eye for anyone. But it does leave the Leafs with their biggest hurdle still to come: beating the Edmonton Oilers in the draft lottery. 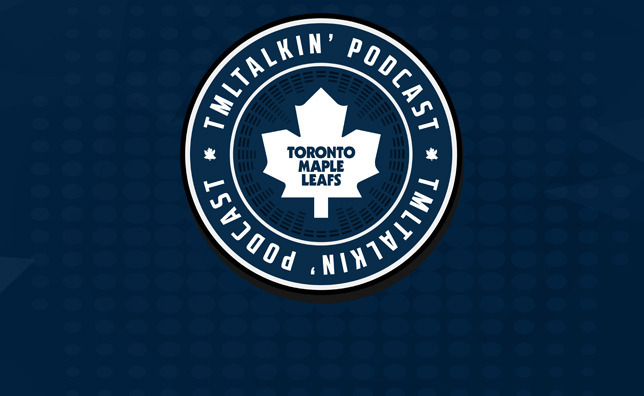 Chris Lund and Adam Proteau return to talk about the Leafs’ Western Canada road swing, Brendan Leipsic and other great debuts and preview fixtures against the Rangers and Flyers. Don’t forget to subscribe to the podcast on iTunes and Stitcher. 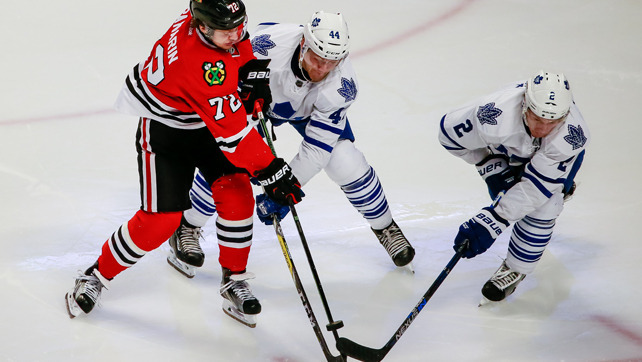 Here’s a sampling of what the Maple Leafs had to say following a 7-2 loss in Chicago. They’re a really good team, but there’s no excuses for our team to lose that bad like that. I think we’ve got to come out harder than that and if you play a better team you can’t use that as an excuse every night. Most of our penalty killers have been with us all year, so it’s our responsibility to know our assignments and know what we’re doing. We got beat in a number of different ways tonight – whether it’s off the rush, in the zone, 5 on 3 – you name it, we got beat tonight. It was a difficult night for our penalty kill and we have to be a lot better. It just wasn’t our night. We just didn’t have it tonight and they were coming. They got a couple of opportunities and they buried on them. They’ve got some good players so that’s what happens sometimes. Well obviously our penalty kill wasn’t near good enough and we took too many penalties, so we weren’t in the game basically from the start tonight. I thought we played a much better second, an even game but we were down three and they just buried us on the powerplay.